Astrid Machulik 6th Dan, returns to Adelaide for the 5th time to teach a master class in Kodokan Kata. Astrid has visited and trained at the Kodokan in Tokyo for many years and is the only German judoka to hold diplomas from the Kodokan in all 7 kata: Nage no Kata, Katame no Kata, Kodokan Goshin Jutsu, Kime no Kata, Ju no Kata, Itsutsu no Kata and Koshiki no Kata. She regularly organises Kata courses in Berlin and takes groups of Judoka to the Kodokan in Japan. 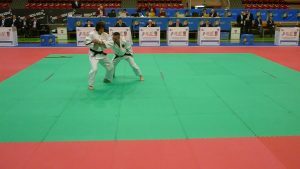 Astrid is an active competitor in Kata winning a Silver medal in the recent EJU Championships in Italy. Please register for either the whole event or a single day by emailing Chris Hustig on cjhustig@gmail.com by Monday April 22nd.